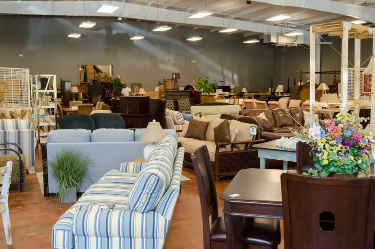 Every day, we sell hundreds of items for satisfied clients throughout Columbia and the Midlands. Our beautiful and spacious 16,000 square-foot facility provides the perfect venue to display your pieces. Thousands of shoppers throughout the region consider us the first place to look and the only place to buy when it comes to furniture and home décor. A: Most items fall in the upscale home décor or home furnishings categories. A quick look around the store is the best way to see what kinds of pieces we sell. Q: How do I go about consigning? A: You may bring up to 25 small items TUESDAY, WEDNESDAY, THURSDAY, OR SATURDAY 10am-5pm without an appointment. The Consignment Desk is located at the rear of the building. For furniture and other large items, please provide us with a picture and description of the merchandise first, including name brand, size of bed, when purchased, original price, etc. Pictures and details help us determine if we will be able to sell your pieces and give you a low and high range of consignment values for your pieces. Q: How do I get pictures to you? simply bring in your phone or camera pictures. Q: Who determines the consignment value? A: We determine the consignment value based on a number of factors, including past sales of similar items, original retail, condition and current local market appeal. Q: Are there special requirements for items to be consigned? A: We will accept upscale clean, gently used items. Allergies are rampant so we cannot accept fabric/leather that has pet hair on it, or smells of smoke or mildew. If an item is torn or worn, it won't sell. Q: Do you provide pick-up service? A: Pick-up service is available via a reputable third party provider. Once your items have been approved for consignment, we will provide you his contact information. He will provide you a quote and schedule your pick-up. Q: How much will I get for my items? A: Provided items sell in the first 60 days, you will receive 60% of the consigned value set by Main Street Home for items valued at $45 or more, and 50% of the value set for items priced below $45. Q: What happens after 60 days? A: After 60 days, all unsold items are marked down 20% markdown to help them sell before the contract ends. Q: When the store offers coupons, does it change my payout? A: No. Store discounts help your merchandise sell faster, but the amount owed to you will not change. All discounts will come out of Main Street Home’s commission. Q: Why doesn’t the ticketed price on my item match my contract price? A: At no charge or cost to you, the consignor, we add a nominal surcharge to all consigned items. This “item fee”, paid by the customer at the time of purchase, insures your item while it is in the store. A: We mail checks on or about the 15th of each month for the previous month’s sales to consignors who generate at least $21 in sales. A $1 processing and handling fee is deducted from each check printed. Q: What if I want to pick up my items before markdown? A: All items must remain for the full 90-day contract. Q: What happens after 90 days? A: We provide you with a 7-day grace period to pick up any remaining items priced $10 or more. You must provide at least 24 hours notice to pick up your items. It is solely the consignor’s responsibility to keep track of the contract’s expiration date. We are unable to provide assistance searching for unsold items. Items that are not retrieved will be donated, discounted or sold at our discretion. Q: How do you know if my merchandise will sell? A: Our expertise in the resale market has consistently led to a 93% success rate selling consigned items for our clients. Additionally, 78% of all items sell before the markdown date. Q: Do you sell holiday or seasonal items? A: Sales personnel can tell you when we take various seasonal items. All holiday items are contractually reduced by 50 % two weeks before holiday.